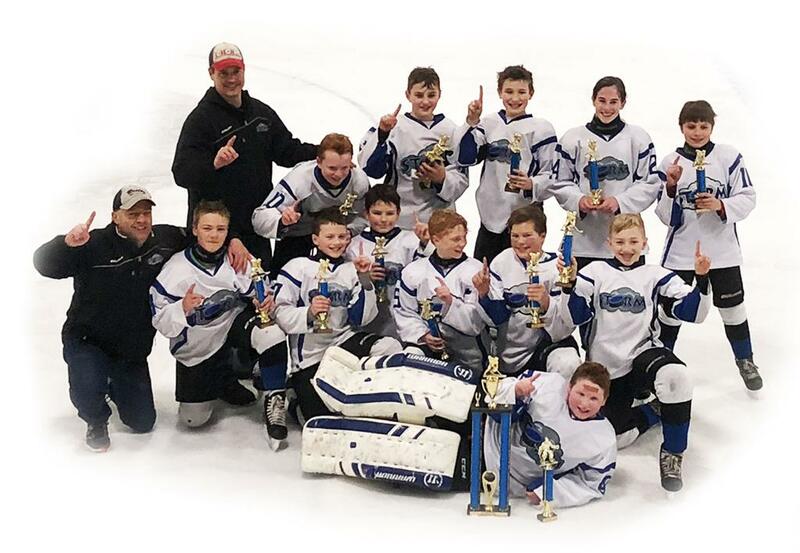 Congratulations to the Upper Valley Storm Peewee1 hockey team after dominating at the Spring Classic Hockey Tournament in Hooksett, NH over the weekend of March 23rd-25th. After a semi-final exit in the Tier 2 NH State tournament, the Peewees were looking to continue their strong season. They did just that with a 10-0 win over Black Ice at 6am on Saturday morning and a 14-0 win over The Green Mountain Knights at 7:20pm. A tight third game at 8:20am on Sunday saw the Storm run into a tough Berlin Sabres team and an even tougher goaltender who stymied the Storm, keeping them scoreless for the first two periods. It was a great pass from Nolan "The Warlock" Morlock to Ezra "Mighty Mouse" Mock in the neutral zone with speed. Mock carried the puck into the Sabres zone beat the Sabres goalie blocker side off the post and in with just 5 minutes to play in the game. Mock's goal was the only of the match and the eventual game winner. The win set the Storm for a battle with the Plymouth Predators who beat Berlin 3-2 earlier in the tournament. The Storm came in prepared and a first minute goal by Ozzy DeFelice set the tone for the game as the Storm went up 5-0 in the first 5 minutes. The Storm were dominant in this one, scoring from all over the ice and capping the weekend with a 10-1 win. Deke "Dangles" Davidson put up 5 goals in this one and took home tournament MVP for the effort while Frank "The Face" Cushing made 5 saves in the win and only allowed 1 goal in 4 contests. Helping Cushing were was his blueliners who not only played spectacular defense but also contributed offensively this weekend. The core consisted of Jack Clary, Matty Hayes, Lochlan Park and Cayden Van Dolah. The forwards were tenacious and smart all weekend. As usual they were led by their fearless leaders, Ozzy DeFelice & Ezra Mock, but the speed and tenacity of Sophie Trombley often set the tone. The puck control of Nolan Morlock, Jack "Silky Wilky" Wilkinson & Davidson made it hard for any of their opponents to gain momentum, but overall it was one of the most impressive TEAM efforts of the season. Unfortunately the Storm were missing Paddy "Smiles" Mooney due to illness, but he was there in spirit.